There are many types of carpet pile available to buy, the two most popular are the cut pile and loop pile. Cut pile carpets are as the name suggests cut to expose the end of the carpet fibres, these are the most popular types of carpet and can come in different lengths and thicknesses. Cut pile carpets are often softer underfoot and have the traditional “carpet” look and feel. This type of carpet comes in a wide variety of styles and colours. When looking at cut pile carpets make sure to check the level of twist, the tighter the twist the more durable the carpet. Twists help the carpet stand up against treading and wear and tear. Loop pile carpets are not cut and therefore the ends of the fibres are left as loops. Durability is a key benefit of loop pile carpets, the tighter the loops the more durable the carpet and the easier the pile bounces back. Loop pile carpets are recommended for high traffic areas such as the hallway or stairs due to their durability. However we do not recommend a loop pile if you have pets, pets claws can get stuck in the loop pile causing it to pull and ruin the finish. 3. Do you need carpet underlay? When selecting a carpet this is a question you are likely to ask yourself. The simple answer is yes, in the long run underlay will protect your floors, insulate your room and make your floors feel much more comfortable to walk on, not forgetting extending the life of your carpet. 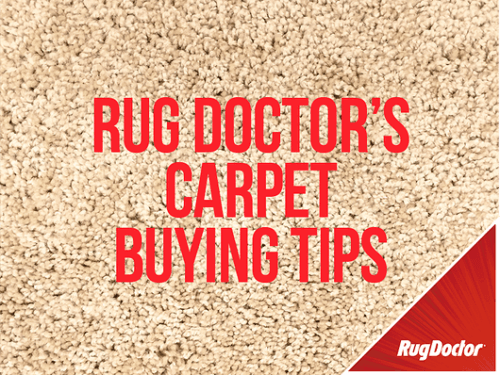 There’s no doubt that replacing carpet can be expensive, so why not try cleaning your carpet first using a Rug Doctor? A Rug Doctor deep clean can make your old carpets look new again; bringing back the “new carpet” bounce and colour. You’d be surprised at the results and it only costs around £22.99 for a 24hour rental, find your nearest store today. This entry was posted in Carpet Buying, House Prep, Hacks. Bookmark the permalink.